Previously, I’ve explained some of the technical points of Flat (or Platform) pedals and shoes, and how to get the most out of this type of set-up. I’ve also gone over some of the not-so-obvious advantages and disadvantages of each type of pedal and shoe combination: flat or platform pedals vs. clipless pedals . Now I’ll cover the technical side of CLIPLESS pedals, a few different types of pedal and shoe combinations, and a couple tricks to get the best performance out of your clip-less shoe/pedal interface. So, we have MAINLY two different types of clip-less pedals. The first has spring-loaded bars that spread apart when under pressure from the cleat on the bottom of the shoe, and then the cleat snaps in between these bars. The bars then hold the cleat in place, and we’re “clipped-in”. Some pedal companies that use this system are Time and Crank Brothers. Some benefits of this system over the other is that its great for clearing mud and debris, therefore it functions well even in nasty weather conditions. It also takes up a bit less space (then the other system that we’ll get to in a second) and, thus, provides more ground clearance from obstacles on the trail. I believe this system also holds the title as the lightest system available. Some of the disadvantages of this system (depending on who you talk to) is that the bars can bend fairly easily when they come into contact with rocks, etc, on the trail. When this happens, its difficult to get into and out of the pedal, and chances are, it’s time for some new pedals. Another disadvantage is these pedals is that they are either non-adjustable as far as spring tension is concerned, or have limited adjustability (I’m almost positive on this point – I may be wrong). Most riders that ride this system don’t mind the limited adjustability, saying that it feels just right anyway, and swear by it. As always, try them out before you by a pair. I’ve ridden this set-up in the past, and really enjoyed it. The other type of system is essentially a Shimano SPD system (there are some other systems such as the ones that Look Or Speedplay use) In my experience, I feel that they have more adjustability in spring tension and a different “feel” in terms of “float” (how far you can twist your foot before the cleat disengages with the pedal) and entry. Shimano also has different cleats: single release and multi-release as well as at least one wild-card cleat that was designed for a very limited type of pedal and is nearly impossible to use with any of their other pedals. I’m not exactly positive what Shimano’s story is on their cleat/pedal recommendations, so all I’ll say on the subject is do your research and try before you buy. Obviously, they’re a great set-up when you get it right. The Shimanlp SPD’s can get finicky in a hurry in bad weather conditions. Any little bit of mud or debris can ball up the system pretty quickly and make it nearly impossible to get into and out of the pedals. To help alleviate this, start out with a clean pedal. Pay special attention to cleaning them thoroughly when you wash your bike. At one end of the spectrum of clip-less pedals, we have a pedal that has very little material and is extremely light in weight, such as the Crank Brothers Eggbeater. 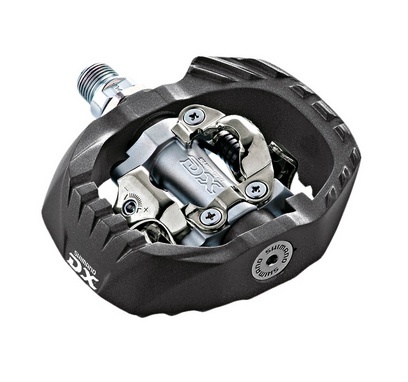 When this type of pedal is used with an extremely stiff and light – nearly XC specific – shoe, it makes for an extremely light and efficient shoe/pedal combination. If I were to race an XC race that wasn’t technically difficult; where power, lightweight, and efficiency were way more important then bike handling skills (say, Leadville 100), I would prefer this type of set-up. On the other end of the spectrum, we have what is essentially a Downhiling set-up, such as the Shimano DX or Crankbrother’s Mallet. I ride with this DH-type clip-less set-up. 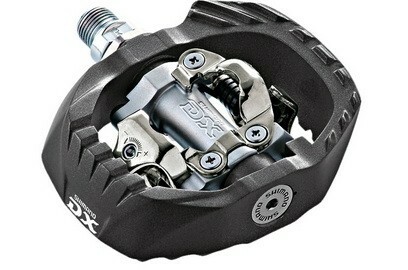 The difference in the pedals is that the DH set-up has a platform that surrounds the pedal, and the DH oriented shoe – though, quite a bit heavier (and more protective) – flexes substantially more then the XC set-up. This allows the shoe to flex enough to come into contact with the platform – while still being clipped-in – allowing for added pedal pressure and leverage to control the bicycle. PEDAL PRESSURE IS THE MOST IMPORTANT THING WHEN IT COMES TO APPLYING POWER, BALANCE, AND CONTROL TO THE BIKE. I actually wear-out the soles of my shoes on the inside and outside of the cleat where my shoe flexes and the sole contacts the pedal platform. Another great thing about the DH set-up is the large amount of rubber on the sole of the shoe compared to the XC version’s hard plastic. This is great because things don’t always go as planned when riding in technically challenging conditions and every once in a while, we have to clip out, put a foot down, and then still have to ride the bike–maybe, down a steep, rocky drop–without having the time to clip back in. With the flexible DH shoe and its rubber-y sole, combined with the large plastic platform of the pedal, you still can have pretty decent control with your foot on the pedal even if you’re not clipped-in. Try this with the hard plastic-on-metal of the XC set-up, and you may as well be on a skating rink! Also, we may have to suddenly clip-out and put a foot down on whatever is immediately available, say, a rock or a log – and, often, we only have one chance and not much time to do this right! If we miss our footing – say our shoe can’t get traction because its sole is made of hard plastic – which doesn’t stick very well to slick rocks or wood – we may end up tumbling down the mountain! That’s one more good reason to have some rubber on the bottom of your shoe! And, sometimes riding mountain bikes requires not only riding the bike, but pushing and/or carrying the bike…sometimes up rocky cliffs…for hundreds of feet, or through dense forests … or rivers … in the dark! Having a good rubber sole on your MTB shoes on “rides” like that is also nice. So if your priority is power and efficiency, go with a light stiff shoe and a light, and minimal, pedal. If you’re riding in gnarlier conditions, you may want something that gives you as much control and peace of mind as possible – even when your not clipped in – such as the DH-type set-up. Once you find your preferred cleat position, LOCK-TITE your cleat bolts (use BLUE lock-tite, medium strength. DON’T use red, high strength, or you’ll never get the bolt off again!). As you can imagine, a loose and twisting cleat – making it impossible to disengage from the pedal – at the wrong time could spell disaster! Also, keep an extra cleat bolt in your Camelback … you never know… A couple more things: trimming the rubber or plastic on the bottom of your shoe with a carpenters knife (or whatever) is a great way to get more clearance for the cleat and easier entry and exit from the clip. This will also minimize the chances of debris collecting next to the cleat and the sole of the shoe. And, stay away from the “clipless on one side and flat on the other side” pedals unless they live on your commuter or bar-bike. Fumbling around on the trail for the correct side of the pedal to clip into is inefficient and dangerous … so is riding the clip side with regular (non-clip) shoes. You won’t see any tops riders riding these pedals!!! I can’t stress enough how important proper pedal/shoe contact are: PEDAL PRESSURE IS THE MOST IMPORTANT THING WHEN IT COMES TO APPLYING POWER, BALANCE, AND CONTROL TO THE BIKE. Hopefully this article was helpful, and keep in mind, a few words on the inter-web are by no means intended to substitute for real-time MTB instruction. Check back soon!!!! !